Talk about a healthy, sweet summer treat?! 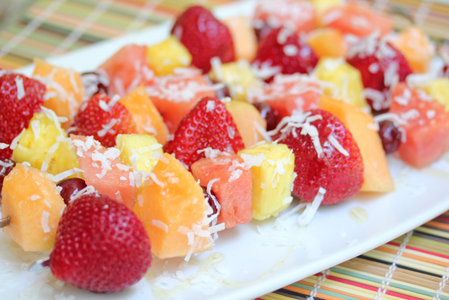 And what better way than with fresh fruit, honey and unsweetened coconut! Or sweetened coconut flakes if you insist on having sugar in your dessert. Or if that’s what you’ve got on hand! Oh…and what you don’t end up using for dessert on the skewers can be turned into a lovely fruit salad. 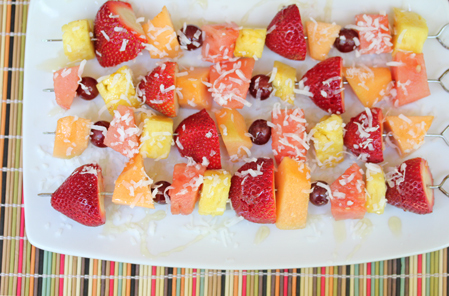 Place the fruit chunks on metal or wooden skewers. Lay them on a serving plate. Drizzle the honey over top. This just looks so good – nice change of pace. Thanks for the idea! These look fabulous; perfectly n’ naturally sweet. I love it. Going to make these tomorrow for my BBQ! Thank you; enjoy your weekend. Made these up tonight for our monthly Bunco night and they were a 100% hit. gonna make these again!